When I first saw Magnesium on our list of products, I thought, “ho hum” why on earth would we have a product that you can get anywhere, mixed in with such a stellar list of one of a kind, life changing products? But then I began hearing some very impressive testimonies on our conference calls about our magnesium, and I began to understand why Magnesium in a Crystalline form is a whole new ball game. And now that I’ve tried it for myself, I never want to be without it ever again, because for one thing, living in the desert makes it twice as hard to stay hydrated, and I have been waking up with muscle cramps that first started in my lower back, but which, to my surprise just disappeared in a few minutes by spraying the magnesium where it hurt the most, and by massaging it in until it was absorbed. But when I woke up the following morning, the cramp was now in my neck, lol “a real pain in the neck” and so I did the same thing, and it too disappeared pretty fast. The real miracle to me anyway, is that these kinds of things have kept me out of commission all day long in the past, but not anymore! I think I may need to carry this spray bottle in a little “holster” though because this morning the darn cramp had moved into my ankle, and so I just did the same thing, and almost like magic it was gone! But on a more serious note, I realize that the heart is also a muscle, and having heard John talk about an article by a doctor who said “many heart attacks could be prevented if people were not so depleted of magnesium,” I decided that I had better start taking a couple of capfulls everyday internally too because I do believe that prevention really is so much better than any kind of cure. Especially when it comes to the heart. Thank You So Much John, David, and everyone who has been working so hard to bring these outstanding products to all of us. Frank from the Mississippi Gulf Coast (verified owner) – March 25, 2016: I damaged my shoulder 2 years ago in a bad fall and broke a rib also. I could not lift my arm over my head for over a year and a half. I don’t go to doctors and I tried some other products, but none of them helped. 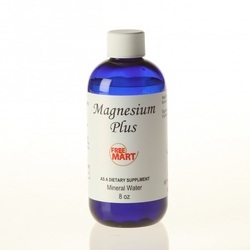 In the middle of January when we got a chance to sample these new products, I ordered the Free-Mart Shiaqga, the Magnesium Plus, and the Gold Plus. We got them on a Wednesday and started taking them right away. On Saturday morning (only three days), I was surprised to see that I could lift my arm with no pain at ALL. The pain was all gone. Now, 2 months later, the pain is still gone and the ringing in my ears is almost gone too. This is a Miracle from above.